You will not be short of choice in Pissouri with many taverns, cafe's and bars ranging from the traditional souvlaki to pizzerias and international cuisine restaurants. Waiters and most people speak English fluently so have fun exploring! 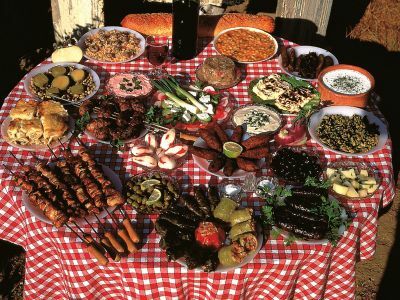 If traditional Cypriot food is what you are looking for (and we highly recommend it!) then most of the taverns offer ‘Meze’ which is comprised of a variety of dishes. Nestled on a quaint street not far from the Village square, a clean but homey tavern serves traditional Cypriot cuisine and family favourites, all prepared and cooked fresh to your table by Stala and her family. Also provides take away. Platea Tavern is situated in the heart of Pissouri at the center of Pissouri’s beautiful square. The tavern specialises in traditional Cypriot food and drink. On Fridays during the summer months the Tavern hosts its famous Cyprus Night with Bazouki, Cypriot and Greek dancers plus other great Cypriot entertainment. Tucked away down a flight of stone steps, situated just off the square in Pissouri Village, a peaceful spot at a wonderful location in a courtyard setting. Situated in the heart of Pissouri in the village square. The tavern specialises in traditional Cypriot food and drink. Rustic tavern run by Marios and Antonis serving home-cooked Cypriot food and a wonderful view. Hani first opened in the 1950’s serving both locals and travellers alike, a daytime restaurant and they are open from 6am in the morning until 6pm in the evening. Serving traditional English & Cypriot breakfasts, snacks and traditional Cypriot cuisine plus vegetarian foods, take-away is also available. Overlooking Pissouri Bay beach, with beautiful views, cuisine is varied with a mix of local fresh fish, traditional Cypriot and International dishes. Mainly a Fish Tavern Since, situated right next to the beach with beautiful views, the menu offered is a selection of Mediterranean cuisine, while apart from fresh fish and seafood dishes, other options are also offered. Authentic Indian restaurant, every palate is catered for and you are guaranteed a warm welcome from Faruque, Nikolayi, Irina and Manoj, who will ensure your meal is served just the way you want it. A family friendly pub next door to the Platea Restaurant. Specialising in tasty homemade bar snacks and meals including is Gyros Doner Kebab. It has a great selection of beers available including locally brewed ales, wines and good selection of Spirits and Cocktails, the bar also shows many sporting events and if you want something on generally they can find it. Pissouri Bay, Tel: 99016203 – Alexis. Only a short walk from the beach, offers homemade snacks, cold lagers, ciders and bitters, bottled beers, vast selection of alcoholic drinks and cocktails, coffees, smoothies, milkshakes, desserts and ice-cream. Live football and other sports are shown. Offering a varied selection of international draught and bottled beers. On draught, they have Keo, Becks, Peroni and Strongbow plus guest beers throughout the year plus wines and spirits. Show’s most major sporting events including English Premier League Football, International Rugby and Formula 1. You can also enjoy a game of darts, dominoes, chess, cards and or backgammon at your leisure.